Wow! This is such a great decorating technique. It makes me laugh out loud though. 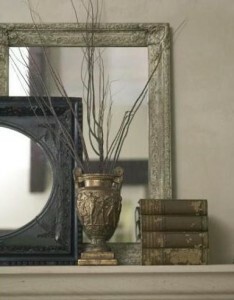 Never in a million years would that have been “OK” when I first began decorating a home. Everything had to have its own space and not shared by anything else. 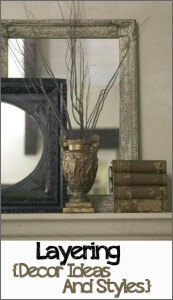 And you would never have considered hanging a picture off center to make way for a tall table lamp or other decorating items. 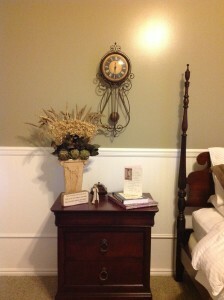 I now have a clock hung off center over a night stand to share visual space with a dried flower arrangement and LOVE IT!! I love the evolution of decorating! It keeps things interesting and it allows for envision outside the proverbial box. These 3 techniques in decorating are fun to practice because you can use literally whatever it is you have around the house. Do you have a table top or the top of a chest of drawers or something? Okay, go right now and grab 7 items that you like. Preferably ones with different heights, shapes, and textures, but for now just go grab 7 items you like. If you chose some books, stack them in front and off to the side of the first one. What do you think? If it didn’t work, go get some more items to work with and keep practicing. This is one of my favorite ways to decorate and change things up a bit. And when you get bored with one grouping, switch it out with something else you have. 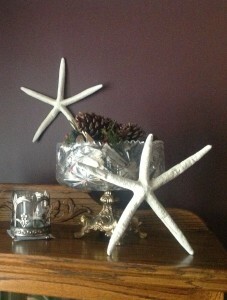 These starfish have leaned against my mother’s favorite bowl, hung on a wall, and topped my Christmas tree.